full clip after the jump. And hippo birdie, where appropriate. Congratulations to Estonia – or Maybe Condolences? Two weeks ago I posted some questions for next year: Ten Economic Questions for 2011. I'm working through the questions and trying to add some predictions, or at least some thoughts for each question before the end of year. 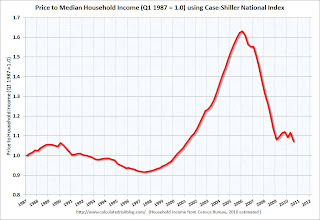 1) House Prices: How much further will house prices fall on the national repeat sales indexes (Case-Shiller, CoreLogic)? Will house prices bottom in 2011? There is no perfect gauge of "normal" house prices. Changes in house prices depend on local supply and demand. Heck, there is no perfect measure of house prices! That said, probably the three most useful measures of house prices are 1) real house prices, 2) the house price-to-rent ratio, and 3) the house price-to-median household income ratio. These are just general guides. 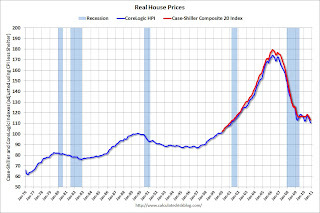 The following graph shows the Case-Shiller Composite 20 index, and the CoreLogic House Price Index in real terms (adjusted for inflation using CPI less shelter). In real terms, both indexes are back to early 2001 prices. Also both indexes are at post-bubble lows. As I've noted before, I don't expect real prices to fall to '98 levels. In many areas - if the population is increasing - house prices increase slightly faster than inflation over time, so there is an upward slope in real prices. If real prices fall to 100 on this index (seems possible) that implies about a 10% decline in real prices. However what everyone wants to know is the change in nominal prices (not inflation adjusted). If real prices eventually fall 10%, that doesn't mean nominal prices will fall that far. House prices tend to be sticky downwards, except in areas with a large number of foreclosures. That is key a reason why prices have been falling for years, instead of adjusting immediately. 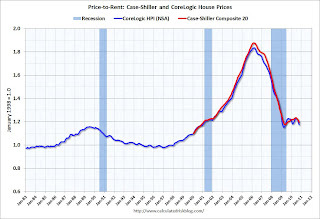 Here is a similar graph through October 2010 using the Case-Shiller Composite 20 and CoreLogic House Price Index. I'd expect this ratio to decline another 10% to 20%. That could happen with falling house prices or rents increasing (recent reports suggest rents are now increasing). The third graph shows the Case Shiller National price index (quarterly) and the median household income (from the Census Bureau, 2010 estimated). Once again this ratio is still a little high, and I'd expect this ratio might decline another 10%. That could be a combination of falling house prices and an increase in the median household income. This isn't like in 2005 when prices were way out of the normal range by these measures, but it does appear prices are still a little too high. The final graph (repeat) shows existing home months-of-supply (left axis), and the annualized change in the Case-Shiller composite 20 house price index (right axis, inverted). 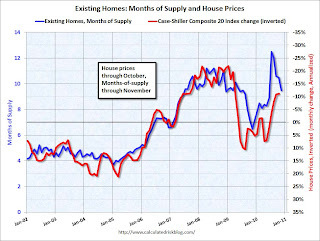 House prices are through October using the composite 20 index. Months-of-supply is through November. We need to continue to watch inventory and months-of-supply closely for hints about house prices. Right now house prices are falling at about a 10% annual rate. Note: there have been periods with high months-of-supply and rising house prices (see: Lawler: Again on Existing Home Months’ Supply: What’s “Normal?” ) so this is just a guide. I think national house prices - as measured by these repeat sales indexes - will decline another 5% to 10% from the October levels. I think it is likely that nominal house prices will bottom in 2011, but that real house prices (and the price-to-income ratio) will decline for another two to three years. Well the argument is at base nonsense on historical, political, legal and economic grounds, but it also suffers a logical hole big enough to run a Prison Bus through. Because if it is true in 2010 it was equally true in 1993 when the Trust Funds first got back to actuarial balance (per McClanahan another myth presumedly) and more to the point in 1983 when Reagan agreed to the tax increase via the Greenspan Commission. Which would logically make Dutch and the Maestro Greenspan pre-meditated thieves and liars. And more to the point you would have to add almost everyone in the political, media and academic establishment who didn't raise this seeming clear objection back in 1993, there being no logical point of separation whereby real assets suddenly turned into mythical ones. True some people have been arguing one version or another of phony IOU for years, but somehow that never got translated into proposals to cut FICA on wage earners, instead they happily collected the money while apparently per Mr. McClanahan never intending to pay it back, the Treasuries never being real to start with. Sorry this argument cannot be made in good faith, not unless this guy had a Road to Damascus/Could Have Had a V-8 moment in the very recent past. A polite term for this is special pleading, though Conspiracy to Commit a few million Counts of Larceny fits pretty well. Do the assets in the Trust Fund have economic value? Well since 2006 the DI Trust Fund has been taking first interest and starting last year principle in cash. And the 'checks' are clearing, what more proof do you need that Special Treasuries have exchange value beyond the fact they are exchanged for value every workday of the year? Now there are arguments that would plausibly suggest that the strain of this redemption will create a problem at some future date, but those arguments should come with numbers and dates and percentages of GDP attached and not just be advanced via 'Shazam! Its a Myth! Oh Foolish One!' No it is a proposal by liars to promote theft. (Which probably blows my opportunity for a party invitation Chez McClanahan). There are lots of Best of Lists out there, but most of them aren’t relevant to real people, i.e. adults (a group I have only recently begrudgingly joined). Those of you with families, careers, hobbies, etc. do not have time listen to 200 new CDs each year. Hence, this list. Rather than cranking out yet another list of music you never heard, this is a more useful list: What a relatively informed music fan’s “Most played” albums were this year (at least, according to my iTunes). These albums are what was most frequently spinning in the car/ipod/computer this past year — my personal soundtrack for 2010. 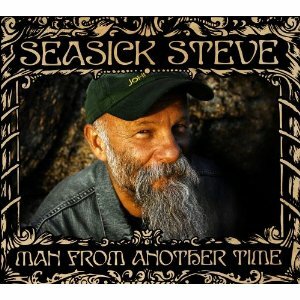 • Seasick Steve: Man From Another Time is a raucous, ferociously exciting collection of organic rock and blues. Home recorded, Steve displays a musical virtuosity and intensity that is belied by the simplicity of his approach. Never before has so much noise been coaxed forth from a single string. Seasick Steve cranks out solid, listenable rock and blues that will have you standing, clapping, tapping your feet. 2009′s Dog House Music is also worth a throw. Bonus: Blues so good it makes George Thorogood weep. The sophomore effort was the disc I wanted to dislike for all too many reasons: At first listen, it sounded just like the debut disc, channeled Paul Simon constantly, and sold out way too soon for a new band — their song Holiday seemed to be on every television commercial this year. But the incessantly inventive, infectiously upbeat, constantly original music made this disc impossible to hate. Its catchy, jangling guitar runs layered with the immediately recognizable vocals are a sophisticated progression from the first album. The sound is immediately recognizable, yet remains fresh and interesting. In addition to the Graceland influence, you can hear bits of reggae, Brazilian funk, and ska. The first disc had a great first four songs, then tailed off a bit. 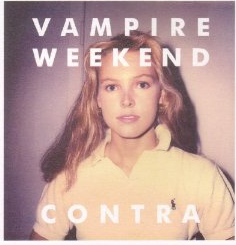 Contra is a consistently strong album — which probably accounts for why I played it constantly. The Black Keys graced our very first “Best of” back in 2004. The reasons I liked it then — crunchy guitar riffs, soulful vocals over no nonsense drumming combining to sound like a lot more than two guys from Ohio — are the same reasons why this disc is on this year’s list. Described as a “mysterious and heavy brew of seventies-vintage rock, classic R&B and timeless, downhearted blues,” the album poweres its way through track after a track til the very end. 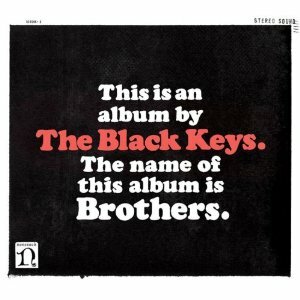 The Black Keys have maturation as song writers and performers, and it shows in subtle ways on Brothers. For those of you who haven’t discovered this great power duo yet, this is their most approachable album. LaMontagne’s fourth album is funkier more upbeat and fun than any of his prior outings. Self-produced, recorded in two weeks at LaMontagne’s home, this album is full of pathos — stories of loss, desire and heartbreak. 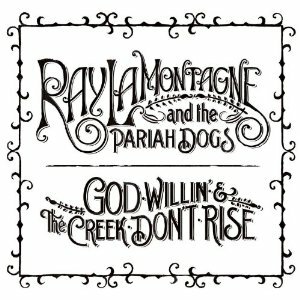 Ray’s vocals perfectly suit his strong songwriting, with a killer band — the Pariah Dogs — providing excellent musical backing. Steel guitars, jangly electrics, snare drums round out the sound to this album that falls somewhere in between Alt Country and Rock n roll. The songs themselves are the stars here, and Ray’s gifts as a composer are on full display. A terrific outing. There are musicians and pop stars and rock and rollers. 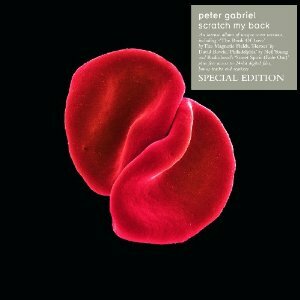 Then there is Peter Gabriel. From his early days as front man of Genesis to enormously successful solo career, from his use of new world instrumentation and musicians, his innovative videos and spectacular live shows, Peter Gabriel is a unique artist. It is not overstating things to say that he is one of the most influential musicians of the past 40 years. Never one to play it safe, Gabriel decided to “re-listen to” some of his favorite songs from other artists — David Bowie, Paul Simon, Talking Heads, Lou Reed, Neil Young, Radiohead — and reinvent their melodies in a no drums, no guitars orchestral arrangement. It takes more than a single listening to — seeing the show at Radio City also revealed how intricate and poised this music is — but it is worth the effort. The result is a fascinating and eclectic mix of familiar yet weirdly new songs, revealing the essence of the original. Sadly beautiful, strange, full of tenderness and remorse, this is an album only Gabriel could have created. This is a new category: “new found appreciation.” Its the album I changed my mind the most about this year. 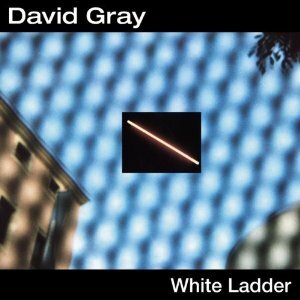 I first heard White Ladder a decade ago — and while the songwriting was worthwhile, I couldn’t get past David Gray’s less than impressive vocals. Then I saw him live, and it changed my entire view of him. He was on a double bill with Ray Lamontagne, and I was all set to leave after Ray’s set was over. But a funny thing happened: We listened to the first song, then the next, and the next, and soon we had stayed for the entire show. Days later, the songs were still running through my head. The disc played constantly late Summer and into the Fall. Once you look past the vibrato-laden voice, his gorgeous melodic compositions make for unforgettable songs. When 2010 began, I never expected to fall for a Gospel album. 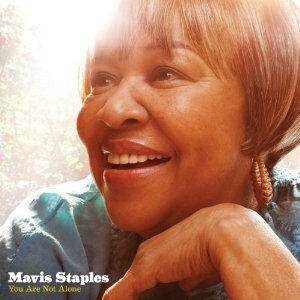 Then again, this is not your run-of-the mill Sunday church music, and Mavis Staples is not your run-of-the mill baritone. She has been cranking out Gospel, Blues and R&B for four decades. Her resume boasts collaborations with Curtis Mayfield, Bob Dylan, Prince, Ry Cooder and on this album, Wilco’s Jeff Tweedy. While this is not a traditional Gospel album, it manages to remain true to its roots by mixing both the secular and the sacred, with bluesy guitars, steel pedal, and upbeat hymns. The element that ties it all together is Staples world weary, smoldering voice. Runner ups: Sharon Jones & the Dap-Kings, I Learned The Hard Way and Robert Randolph and the Family Band, We Walk This Road. 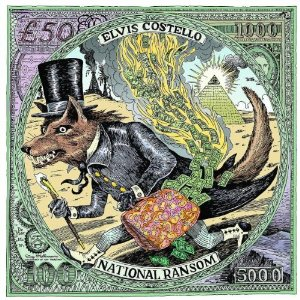 I am always interested in anything Elvis Costello records, but this disc caught my attention for its cover art — a wolf in Banker’s top hat and tails, fleeing a crisis, the carpet bag he clutches trailing flaming cash the whole way. It is an arresting vision of the economic crisis, too close to the truth for most people’s comfort. Costello is in fine form on the this album. He has always been idiosyncratic, and this eclectic disc is no different: Tasteful and lyrically sophisticated, it meanders through genres from hard edged rock, New Orleans jazz, acoustic jazz, country, ballads, blues, with a little of the the old “Elvis Costello and the Attractions” thrown in for good measure. All the shifts in style and form are to further the narrative each song presents. This is an album that rewards the patient listener — its not in your face (i.e., Vampire Weekend) but is filled with little subtleties. It gets better with subsequent listen. I used to occasionally listen to Sade back in the day — it was pleasant enough, inoffensive “seduction pop.” Sade’s sensual voice was the highlight of their music, even if the song’s quickly became overplayed, even cliched. 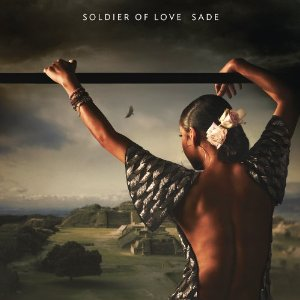 Soldier of Love is Sade’s most mature, sophisticated album. It has less pop hooks, and more eclectic, quirky and even joyous melodies. Any hip hop album that begins with Black Sabbath’s War Pigs gets my attention. Add to that the free download, and the killer graphic of all the artists used, and you have the making of an instant hip hop classic. There are 372 samples in the album, all instantly recognizable hooks. 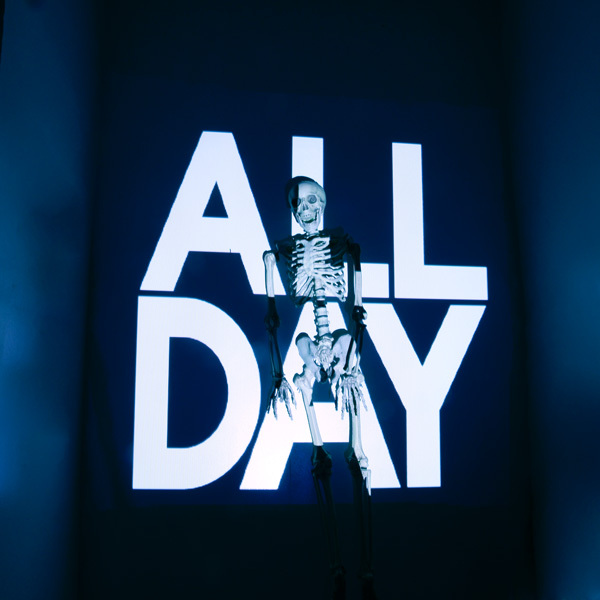 The mega mash up serves as rehabilitation for disposable pop of days gone by, lovingly assembled in a stupendously danceable form. Bonus: Your teenage kids will be impressed you even know this. Follow this progression: A reader sends me an MP3 of LTJ Bukem’s Logical Progression (from the out of print disc of the same name). I go ahubting for it, can’t find it, but stumble across this chill mix of etheral beats, containing a song from LTJ Bukem. Airy jazzy, euro synth driven tunes, good for a relaxing massage or bubble bath. 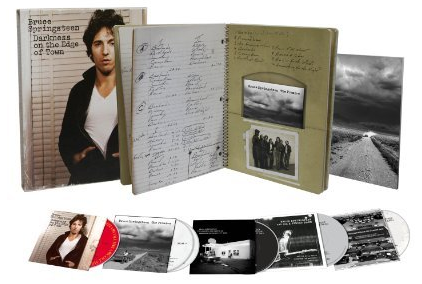 This is no ordinary box set– it includes six hours of film, two hours of audio across 3 CDs and 3 DVDs, along with an 80-page notebook, It also features The Promise: The Making of ‘Darkness on the Edge of Town,‘ a ninety-minute documentary film directed by Grammy- and Emmy-winning filmmaker Thom Zimny. The album itself shows Bruce’s talent for editing himself — no easy task for any artist. There are 22 unreleased songs in this package, and they could have easily slipped into The River or Born in the USA without disrupting much. Fans of Springsteen will find this material fascinating; those of you who are unsure if this work will be to your liking should check out the outstanding reviews at the LATimes and especially Pitchfork. • Beatles Covers: And speaking of Box Sets: Forget the Beatles on iTunes — anyone who wanted the full digital Fab Four catalogue bought the Box Set and ripped it lossless in 2009. Thsi year, I’ve been getting my Liverpool fix from various Beatles cover albums. -LJ Plays the Beatles (plus Volume Two) Paul McCartney’s guitarist from his Wings period, Laurence Juber, recorded two albums of Lennon & McCartney music — all finger pickin, all acoustic guitar. Very mellow versions, that make for an interesting surprise when mixed into other playlists. -Rubber Soulive: Imagine the Beatles covered by a jazzy retro groove band, recorded live-in-the-studio, sounding both old school and fresh at the same time. The drumming is all over the place, with a thumping jazz bassline. The essence of the melodies are all here, but the band takes them off in different directions. A very different, surprisingly fun find. -Easy Star’s Lonely Hearts Dub Band: From the band that brought you Dub Side of the Moon, comes this reworking of the Beatle’s classic album, infused with reggae rythms. Its an upbeat, joyously fun outing, one that reworks Sgt Pepper’s surprisingly well. Guest appearances by Steel Pulse, Matisyahu, Michael Rose [Black Uhuru], Luciano, U Roy, Bunny Rugs [Third World], Ranking Roger [English Beat], Sugar Minott, Frankie Paul, Max Romeo and The Mighty Diamonds. Check out a few tunes here. Just Where Is The Equity In All Of This? Little Dent In The Story?...Recently demographer Harry Dent and Dave Rosenberg have been discussing the fact that as we look ahead over the next 12 years or so, the 45-55 year old population segment in the US is set to decline. It's the population wave coming after the boomers and before the gen-xer's. Of course, and as the graph below so eloquently displays, following the boomers in terms of a population bubble is one hard act as you can see what the boomers did to the 45-55 year old population segment in terms of growth from the early 1980's until literally now. For anyone who has been a demographics devotee, this should not be new news at all. As you know, Dent has made a very nice living as demographer and financial market commentator, basing his ongoing economic and financial market outlook on forward demographics. To be honest, there is a lot of validity in his approach and we suggest his comments be included as one tool in the greater toolbox of longer term decision making. As both Dent and Rosenberg have recently pointed out, and as the graph above unmistakably presents, the last time we saw a decline in the 45-55 year old US population segment was from the mid-1970's to the early 1980's. Specifically, this population group peaked in March of 1973 and then troughed in July of 1983 before literally exploding higher until just recently when we have again seen yet another peak for now. Dent expects a steady 45-55 year old population segment decline into the 2021-22 period. Both Dent and Rosenberg suggest investors focus in on this fact intently as it's the 45-55 year old age bracket that is the largest consumer segment, the largest investor segment, etc. If indeed nominal body count decline lies ahead, then just what does that say for the US economy and financial asset prices that theoretically are a reflection of the real economy? In the following table, we basically singled out the period described above of covering the peak and trough of this population segment in the 70's and 80's. And what we are looking at is the increase in real US GDP over the 3/74 to 7/83 period. For a bit of compare and contrast, we took equivalent roughly nine year periods both before and after this population slowdown to see what real GDP growth looked like when the 45-55 year old crowd was a growing population segment. Do you think Dent and Rosenberg have a point germane to investment decision making? Of course they do. No wonder Dent is so uber bearish, right? To make matters a bit more somber, you may remember back to our "You Dream Of Columbus" discussion in September. One of the key themes we were trying to get across in that commentary was that as long as the US Government is levering up, there will be a downward bias to US GDP growth, exactly as we have seen in Japan for a few decades now. So, it appears we have demographics and financial gravity telling us to expect economic volatility and fragility looking out over the next decade. Although we believe the Dent and Rosenberg driven analysis above is very much to be taken into decision making consideration ahead (and we will), we are not bringing this up to regurgitate what both of these analysts have already said regarding the projected character of the domestic economy ahead. In fact, you don't want to know what Dent is saying, to be honest. He sounds a lot like Bob Prechter in terms of forward equity index targets. Just remember that when Dent was bullish decades ago also due to demographics, he put huge targets on the equity indices that were never reached. Not even close. In fact, we never even made it half way to his targets for equity indices. So for now we take the downside nominal price targets with a grain of salt. For now. And in no way do those prior equity market targets that never came to be negate the fundamental message of how demographics can shape both domestic economic and financial market outcomes. Before really getting to the heart of this discussion, one last data point concerning the 45-54 year old US population. The chart below is a quick peek at current unemployment circumstances for this group. We're looking at the number of folks in this age demographic that have been unemployed now for half a year to a year. At least over the history of the numbers, we've never seen anything like this in any prior cycle. Also, a bit of the reconciliation you see lately is more a result of folks falling off of unemployment benefit rolls as opposed to finding jobs. Just another log on the fire of demographic consideration? You bet. The point of this discussion is to veer off into a bit of a different compare and contrast exercise relating directly to US equities. At the very worst, we hope we are asking the right questions. Point blank, what does history have to say about how equities may react when the 45-55 year old population goes into decline over the next decade plus? If indeed real GDP growth slows meaningfully as has been the case so far into the current recovery cycle, perhaps compounded by the fact that Government leveraging by necessity will only put more downward pressure on economic growth, what influence will that have on equity valuations, etc.? And lastly, are there any important differences between the period of the mid-1970's through early 1980's relative to our present cycle circumstances, and if so how will these differences potentially impact US financial markets ahead? Let's start with a quick look back at the S&P during the period where we last saw the 45-55 year old US population go into multi-year decline. It's exactly what you see below and we have marked the points of 45-55 year old population peak and trough experience on the S&P chart itself. Very quickly, did the equity market discount the temporary lull in population growth for this very economically important demographic segment? You better believe it did. As is clear, equities peaked in late 1972, a year before the 44-55 population segment peaked in what had been continuous growth up to that point. In like manner, the S&P bottomed for the final time in mid-1982 just prior to blasting off into one of the greatest US equity bull markets of all time. This was exactly one year before the 45-55 year old population segment bottomed. Like equities, growth in the 45-55 segment then blasted off into the greatest growth in the 45-55 year old age bracket in the history of the US . The boomer bulge bracket is all too familiar a story and central to Dent's prognostications. So, the wonderful efficient equity market that discounted this demographic shift a year in advance of both the peak and trough showed us equity prices that went absolutely nowhere for a decade (late 1972 through mid-1983) as this demographic segment lull in growth occurred. No wonder Dent is so somber about the next decade, right? Yep, this is pretty much the Dent story. So what can we expect ahead? Yet another range bound equity market that has really already been the case over the last 12 years? Another lost decade so we can join the Japan economic and financial market fan club? Just Where Is The Equity In All Of This?...In contemplating just how forward demographics will potentially influence equity markets ahead, just one more quick qualitative look back. Remember, in the early 1970's, the baby boom generation was just warming up in terms of how they would profoundly influence both the real economy and financial markets. With the enactment of ERISA in 1974, corporations and government entities were now being mandated to provide retirement benefits for this explosive demographic group that was to blossom over the years ahead, along with pension contributions. So in 1974, we were then staring at the next three and one half decades of corporations, and ultimately individuals, acting to fund retirement pools of assets in a one way street characterization of cash flows. You know the story, this was a generational headwind demand for broad based equity "consumption" (purchasing) unrivaled in US history. With ERISA also came the introduction of the IRA vehicle that was yet another non-pension related source of equity demand, all of this coming together in simultaneous fashion. And as the baby boomers matured and their wages accelerated, equities became close to a national pastime over the next quarter century. That one time demographic and legislated driven demand for retirement asset purchases rode the path of the ever aging boomer that at this point is not so much any longer interested in accumulation, but rather how this thirty five years of asset accumulation will be spent down in retirement years. Exactly the same can be said for pension plans, especially defined benefit plans. After all, corporations have zero interest in over funding defined benefit plans as from an actuarial basis they would love the last nickel in plan assets to be paid out five seconds before the last boomer breathes their last. In addition to demographically driven demand for equities vis-à-vis the largely ERISA driven retirement mandate, the boomers also helped herald in the greatest credit cycle expansion the US has ever experienced. We've covered this so many times, you know exactly how this very positively influenced economic outcomes over the 1980-2000 period. This was the landscape that lay before us in the early 1970's during the first 45-55 year old population downturn. Fast forward to today and this virtuous set of circumstances for both the economy and financial asset demand has just about been completely turned on its proverbial head. The generational credit cycle has peaked. Probably the last thing the 45-55 year old population needs to do today is to take on more debt. In case you have not been with us over the last few years, credit cycle dynamics are now an economic boat anchor around the neck of the economy, with the focal point being US households. Secondly, with the downturn in household net worth and the generational collapse in interest rates, those boomers who hoped to retire on their savings and earn perhaps a safe 5% rate of return are now wondering just how they could have been so wrong. Terrified, they are faced with the reality of spending both earnings and principal in their retirement years. We believe it is very fair to say so many folks simply never saved enough and came to count on equity and residential real estate price appreciation until the hereafter. As the boomers age, they will now draw down defined benefit plan assets, IRA's, 401(k)'s, etc. The one way street of contributions will reverse to become steady distributions in the decades ahead. As mentioned, 180 degrees from the circumstances faced in 1973. Is this about to have a dramatic impact on financial assets tomorrow? Hardly. This is big macro and will play out over decades. But it tells us that the buy and hold macro of baby boomer and pension plan accumulation years is well behind us. A different era macro simply calls for a different investment decision making game plan. It's not the end of the world by a long shot. Okay, here come the charts. Hope you are ready. We'll make this quick. We want to review the current composition and character of the component owners of US equities as of 1Q 2010 numbers. Where are the liquidation risks ahead given the clear need of the boomers to monetize these assets in the decades ahead? As of right now, ownership of US equities can be characterized by the chart below. As seen, households and mutual funds are the two largest equity owners. Remember, households include the Warren Buffet's (although his equity has theoretically been gifted), Larry Ellison's, etc. of the world. Is there a lopsided skew here? You bet there is. But between households and equity mutual funds, you are looking at over 55% of total publicly traded US equity ownership. And it's households that represent the bulk of mutual fund ownership. Will at least some of this be liquidated in the years ahead to fund living needs? Absolutely. Although we'll come back to this in a minute, we really want to focus in on the institutional owners of US equities. As we see it, these will be the most at risk sellers of US equities in the decades that lie in front of us. Collectively, private and public pension funds as well as insurance companies (think annuities) own 25% of the current US equity market. Will they in 10 or 20 years? Doubtful. And perhaps more importantly, to whom will they sell? It's not just the question of potential liquidation that looms a bit large right now. Also very important to the discussion is the question of whether this collective group of significant equity buyers of the last three plus decades will be important buyers ahead? As we see it, a few will not. The chart below look sat current equity ownership of US households. We're looking at their asset allocation here, if you will, as we measure US equities as a percentage of total household assets. For now, US households are very near their long term average exposure. But the important question ahead is will they again ramp up equity buying relative to alternative financial assets, especially since the folks with most of the money (boomers) are entering retirement years where they cannot afford to lose anymore than has already been the case over the last decade plus? You can see the character of the generational cycles of household equity ownership over time. It would be our bet that returning to prior asset allocation peaks is out of the question any time soon. You already know we've seen consistent equity mutual fund sales over what is close to the last 30 weeks, rallies or no rallies. Have households simply had it with the volatility? Sure could be. Thank you SEC and Administration for turning a clearly determined blind eye to how electronic trading has recharacterized short term equity market outcomes. Foreign ownership of US equities as a percentage of total financial assets has been very steady between 15-20% really over the last close to the last four decades. Although this may sound wild, if we had to pick a constituency that just might end up being an important buyer of US equities ahead, this would be it. Why? Because we expect many emerging nations to ultimately travel down the path of social benefit creation the US has walked over the last three to four decades. And if so, they may indeed be interested in large blue chip US equities that are essentially in many cases global mutual funds in and of themselves. After all, so many global blue chips have global name recognition. Plus, we certainly expect household disposable income to rise meaningfully in the emerging nations in the decades ahead. We'll just have to see what happens ahead, but this may be a bright spot. The next five charts are really the focal point for this discussion. Below we are looking at the "institutional" holders of US equities. We're talking insurance companies and private and public pension funds. They have ridden the boomer wave of asset accumulation and will necessarily be buffeted by forward retirement living expense payouts and distributions in the decades ahead. If there is to be a sourced headwind for US equities ahead, these folks would be ground zero. After an almost uninterrupted three to four decades of accumulation of financial assets, we're about to move right into distribution mode. The top clip of the chart below covers insurance companies in aggregate (life and PC), but by far the largest exposure here is life companies. Just think variable annuities. As the boomers ramped up retirement savings into the equity bull market, insurance company exposure to equities close to doubled in the prior fifteen years relative to the five prior decades. As annuities are drawn upon in the years ahead, just where do you think this ratio will go? As the boomers age, we'd personally expect a return at least to the longer term average. And that assumes equities do not experience serious price trouble along the way. Distributions and payouts alone could drive the ratio back to the longer term average. These folks are certainly a source of equity liquidation ahead. An absolutely major issue for the pension industry as a whole in the US is under funding of plan assets. For the private sector under funding will be reconciled out of corporate earnings over time. You can see in the bottom clip above the history of total nominal dollar private sector pension assets. As of now, we're just not that far away from where we stood in 1999. Ten years and not a lot of growth means very large under funding potential. Important why? Because if equity prices do not "behave" ahead, private pension sponsors may be quick to pull the plug on volatile equities. Why risk a deeper under funding hole at the expense of sacred reported earnings? You know these folks used to be considered longer term investors. With the baby boomers aging by the day that is definitively no longer the case. Private pension fund equity exposure seen below in the top clip is just a touch misleading. Although the ratio appears pretty darn steady over the last four decades with a recent drop off more than apparent, underneath change has surely been afoot. Alternative asset exposure in the relatively progressively thinking private pension world has grown markedly. Is private equity also equity? Sure it is, but you won't see it below. How about hedge exposure? You bet. You get the picture. The true reality of equity exposure here is higher than you see. If there is to be a very meaningful seller ahead, this would be our pick. Why? Most private sector pension plans are defined benefit. As mentioned, by academic definition these should be self liquidating as the boomers ultimately age and leave us. As wild as this may sound, private sector pension plans may be a distant memory in thirty or forty years. So what will happen to these assets? Are you kidding? They will be sold. As of the second quarter of this year, private pension funds were holding $1.67 trillion of US equities. That's about 9% of the total US equity market. It has been estimated that pension under funding at the State and Local muni level is near $3 trillion as we speak. We fully expect a government bail out at some point. But given that level of current under funding risk, just look at how exposed these folks are to equities as seen in the bottom clip of the chart above! They are the last folks that can tolerate a severe and prolonged downturn from here. Let's just hope a lot of these folks do not take Harry Dent's newsletter. If they do, they have not been sleeping for quite some time. These assets are clearly at risk of liquidation due to payout and distributions over time. Exposure at the end of 2Q 2010? $1.45 trillion. Public and private pension funds are sitting on $3.1 trillion of equities as of mid-year. These are the very folks who will be liquidating to pay out benefits in the next few decades. Moreover, looking ahead at actual payouts and realizing a glaring under funding exists in public pension plans, the State and muni entities have a number of choices. Put up the cash to fully fund the plans - not feasible. Use existing pension assets and muni general fund assets to make payments ahead - not likely as per the general funds kicking in so early in the pension payout game. Fund payouts solely out of plan assets, risking deeper under funding ahead - bingo, near term choice of fiscal expediency. You get the picture. States and municipalities will liquidate plan assets prior to digging into general fund assets. To the point, public pension funds have much greater under funding problems than is the case with the private sector at the moment. And the public sector is also under the most fiscal pressure as we speak. Does having such a high allocation to equities only heighten State and municipal solvency issues? Without question. As mentioned, it's the institutional holders of equities that we need to monitor ahead. These are the folks who will be liquidating assets to make promised and requested payouts/distributions to the boomer crowd. As mentioned, collectively these folks own 25% of total US equities outstanding. Below is the collective "institutional" allocation to equities of these three. We're above longer term averages by about 10% at present. And it gets much tougher as we move ahead. With current bond yields at generational lows, just where are institutional holders of US equities to find simple nominal rate of return? Equities seem the logical choice over bonds. But for institutions who are nothing short of certainly faced with promised distributions in the years and decades ahead, just how much investment risk can be tolerated and for how long? The world is not about to come to an end, but demographics and the character of institutional holders of US equities will be a mandatory analytical focal point as we move forward. Have we hit or are very near to hitting something along the lines of an institutional tipping point in terms of the supply/demand balance for equities? This set of circumstances helps argue for a range bound market, volatility as a key construct, and the need for active asset allocation ahead. As a very quick anecdote, right now the pension system in Japan has begun liquidating JGB's (Japanese Government Bonds) to meet pension obligations. This is a first and certainly a trend that will continue. Watching Japanese experience will be important as their baby boom contingent is about a decade ahead of the US . What were once demographic tailwinds for US equities are set to become headwinds. Again, this is not end of the world stuff here. As in sailing, tailwinds turning to headwinds just requires a change in navigational technique inconsistent with the prior approach. Range bound, volatility and active asset allocation will hopefully get us safely to shore as the winds of change gather force with demographics. Can we avoid landfall on the equity index targets suggested by Mr. Dent? We believe they are extreme, but he has the direction of the trade winds correct. Holiday delay today means this week's Commitments of Traders report will be issued Monday afternoon instead of today. Happy New Year!